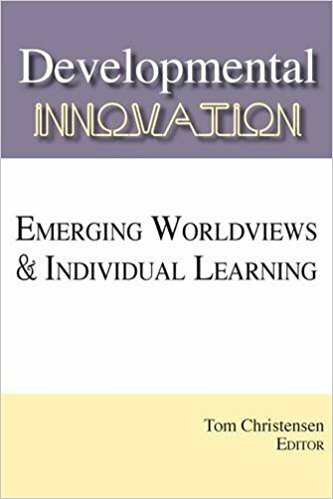 ‘The Use of SDi in Therapy’ is one of 2 contributions commissioned from me by Tom Christensen for his compendium, Developmental Innovation: Emerging Worldviews and Individual Learning (Integral Publishers, August 2015). Spiral Dynamics Integral (SDi) is often thought of as a means of addressing large-scale issues such as inter-racial conflict, socio-economic malaise and global power plays. This is the way Don Beck himself has used the model in the past, to great success in South Africa, and has been using it more recently, with great promise, in the Middle East. However, Beck (2008) himself- refers to micro (individual), meso (inter-group) and macro (global) applications of SDi. Thus, there clearly is, in Beck’s view, a legitimate application of the model at an individual level. It also needs to be remembered that Clare W Graves, on whose work SDi has been built, was a psychologist, not a sociologist, though he saw the boundary between the two disciplines as unnecessary and artificial (Beck, 2002a). While I’ve written much on my Blog about social and political applications of SDi, a significant proportion of my work has actually centered on using SDi in Personal Therapy – my take on psychotherapy – with individuals. My approach can be thought as both ‘integrative’ and ‘eclectic’. Using the distinctions of Stephen Palmer & Ray Wolfe (1999), it is perhaps more ‘integrative’ in that I take a combined approach to theory and practice – ie: everything is aligned, streamed and integrated around a few core models, of which SDi is the most important. However, I would still claim it is ‘eclectic’ in that I feel no compunction about stealing any idea from any concept if it will work in the interests of a client. And, I can usually see how what I ‘steal’ fits within the framework of what I call Integrated SocioPsychology! I often get told that I am one of the few therapists working with SDi at the level of the individual. While I find this hard to believe, the fact that I get therapy clients Skyping with me from afar, including people from other countries, because they can’t find a closer SDi-oriented therapist is perhaps indicative of a genuine shortage. My first step in consulting with a client is to treat the hypothetical concept of vMEME as an unequivocal reality. In my experience, therapy clients are rarely interested in the scientific arguments for and against the reality of a hypothetical concept. Nor are they usually concerned with the quality of the evidence supporting such a concept. They want help and they want to believe that, whatever help the therapist offers, that help will make a positive difference to their lives. As Bruce Sloane et al (1975) identified, trust in the therapist (which ever techniques they favour) is a key element in successful therapy. In other words, being convinced that the therapist knows what they are doing is a critical factor in building the trust essential to successful treatment. That said, it is undoubtedly helpful to the client if the models applied and the techniques used appear to have ‘scientific credibility’. Although SDi generally has a low profile amongst academics in the behavioural sciences, the fact it can be easily matched to other models, such as Maslow, Loevinger, Kohlberg, Adorno, etc, helps to establish that trust which is critical to successful treatment. It is then possible to show that, although these other models may have a higher profile, they are less intrinsically complete and, therefore, it is advantageous to use SDi as the foremost model. Getting the client to understand that they have up to 8 motivational systems operating in their psyche/selfplex and that each of these vMEMES has different needs, wants and desires is the next step. I was initially surprised to find that clients usually can access a basic understanding of different and sometimes conflicting motivations without a full-blown exposition of SDi. Simple, everyday examples of vMEMES working can illustrate the concepts enough for clients to get the basic idea. 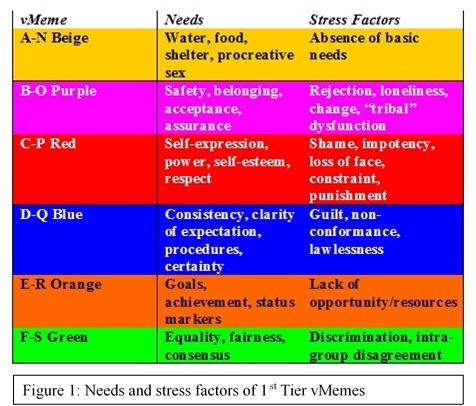 The broad needs of the 1st Tier vMEMES, along with key stress factors, are shown in Figure 1. Of course, it helps enormously if the client already has some idea of SDi, especially if they have already done training with me. Sometimes clients, in wanting to understand their motivations more, have gone on to join one of my workshop programmes. Thus, there is periodic traffic between these two arms of what I do. As many people in the UK have studied Abraham Maslow’s Hierarchy of Needs at a basic level as part of GCSE Business Studies, SDi can also be presented to them as an extension of Maslow’s work. This can help them to understand the role of vMEMES as fulfilling Maslow’s ‘needs’. A key part of any therapy I undertake is to consider the health of each vMEME motivational system in terms of its functioning to meet its needs, wants and desires. In the early part of most consultations, I will draw a mind map of the client’s life, from as early as they can remember to their current difficulties. Whilst occasionally, a client may have a specific set of current circumstances which they are experiencing difficulty with, in a way that is effectively isolated from the rest of their life, usually the current problems are a reflection of deeper and more pathological issues often initiated in childhood. In this sense, my approach is heavily influenced by the groundbreaking Psychoanalytic work of Sigmund Freud (1900; 1901; 1920; 1923a; 1923b; 1924) whose 3-part mind concept of Id, Ego and Superego is easily assimilated into the 8-part mind concept of SDi. I usually find that most clients have a core belief about themselves which effectively equates to “I’m not good enough”. Usually, though not always, longstanding pathological issues are to do with childhood insecurity (the PURPLE vMEME not having its needs met) and/or suppression of being able to express yourself (RED not having its needs met). Since these vMEMES are effectively the cognitive foundation of the Spiral, damage to or inability of these vMEMES to function properly can throw the development of the entire Spiral off in an individual. In almost all of the individual case studies to be found in the Services section of this site, the problems are with PURPLE and RED malfunctioning. In the case of ‘Susan’, for example, it was almost as if, with resolving the issues of PURPLE and RED, her entire Spiral began to right itself with peak BLUE making its first real appearance in her life. People tend to treat the beliefs they have as being reality. This is fine if their beliefs work for them positively and at least do not impinge negatively on others. It’s not so fine if their beliefs work to their detriment or the detriment of others. Many psychologists and psychiatrists, from Aaron T Beck (1972) on, refer to such beliefs as ‘maladaptive schemas’, ‘maladaptive’ meaning ‘badly learned’ or ‘badly adapted’. While there seems to be some considerable confusion over use of the terms ‘schema’ and ‘meme’, I have found it helpful to differentiate schema as being the internalised belief while meme serves to describe the idea outside of the individual’s head, whether in a book, a film, music or the words and/or actions of another. Thus, the schemas in someone’s head are learned or adapted from memes which, in the terminology of the neo-science of Memetics, ‘infect’ to form new schemas or amend existing ones. The benefit of this approach is that the client can start to see their own often deeply-held beliefs as just schemas which invariably they have developed from memes. The younger they were when the beliefs were formed, the more likely they are to have been developed from interaction with others, especially significant others such as parents and friends. Amongst other researchers, Dale Hay & Jo Ellen Vespo (1988) have reported parents providing young children with direct tuition to produce what George Herbert Mead (1913) calls the ‘social self’. 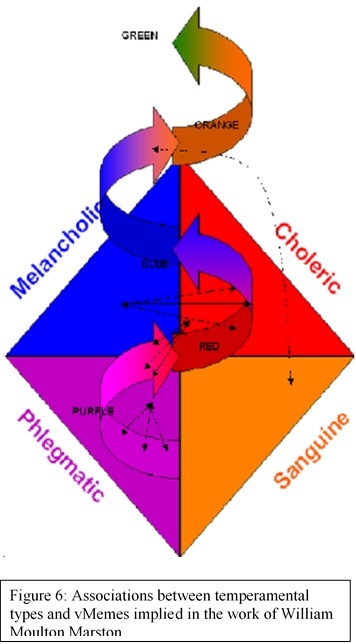 To reflect Mead’s concept, I far prefer to use Susan Blackmore’s (1999) term, ‘selfplex’, rather than ‘psyche’. Blackmore’s term makes it clear that your concept of ‘yourself’ is merely a collection (or confluence) of schemas. Since schemas are just ideas, ideas can change or be changed. One of the best means I’ve found of getting clients to realise the arbitrary and sometimes transitory nature of beliefs is the ‘Falling in Love Meme’. The search to find ‘true love’ is one of the Western world’s most ubiquitous memes. Thus, people fall in love, applying memes such as ‘soulmate’ to their partner, and base astounding life-changing commitments such as marrying, buying a house and having children on the schema that they are in love with their boyfriend/girlfriend. 10 years later approximately 45% of those people now love someone else and have moved on. Where did your maladaptive schema come from? Ie: who gave it to you? Since, according to many developmentalists such as Ralph Allison (1995), our first real cognitive sense of self (selfplex) forms around 6-8 years of age, it is a legitimate question to ask who (which older persons) influenced the formation of such maladaptive schemas as “I’m no good”, “I’m stupid”, “I’m annoying”, “No one likes me”, etc, etc. All too often I’ve found it’s an unwitting parent who has initiated the beginnings of that core belief. Due to cognitive primacy, the tendency to filter incoming memes for evidence to support existing schemas, the memes which tend to get through have a reinforcing effect on what is already there. Which vMEME is related to that maladaptive schema? Since, as Figure 1 shows, each vMeme has its own set of concerns, the vMEME dominating in the selfplex will be receptive to some incoming memes and not others. For example, PURPLE will be highly concerned with memes relating to its safety and acceptance…or lack of them. RED will seek to dominate others who are lower in the ‘power pecking order’ while being grudgingly subservient to those with demonstrably greater power. At the same time RED will have little cognisance of the memes of ‘doing what’s right’ that BLUE puts out and is likely only to obey the rules if those rules are enforced with greater power. Thus, there is a second filtering effect on how we make sense of information coming in from the outside world. SDi, of course, offers no tools as such with which to treat maladaptive schemas and repair damaged and/or malfunctioning vMEMES. However, as an NLP Master Practitioner, I have found that Neuro-Linguistic Programming offers a number of powerful tools which can help do that. Cognitive Behavioural Therapy (CBT) also provides several techniques which can be used both to facilitate ‘Spiral diagnosis’ and to help someone take affirmative control of their life. For clients with problematic PURPLE and RED stemming from childhood experiences, I’ve found the ‘Inner Child’ exercises designed by Penny Parks (1994) very effective in giving back the maladaptive schema to the person who gave it to the client and showing the client how things should have been. Most of the case studies make reference to using Parks’ techniques. As well as taking a Maslowian approach to look at the health of the vMEMES in an individual’s selfplex in terms of their functioning to achieve needs, wants and desires, sometimes it can be critical for the client to gain insight into how they interact with the external environment. For this, I have found it a great help to link SDi to Robert Dilts’ (1990) Neurological Levels model. 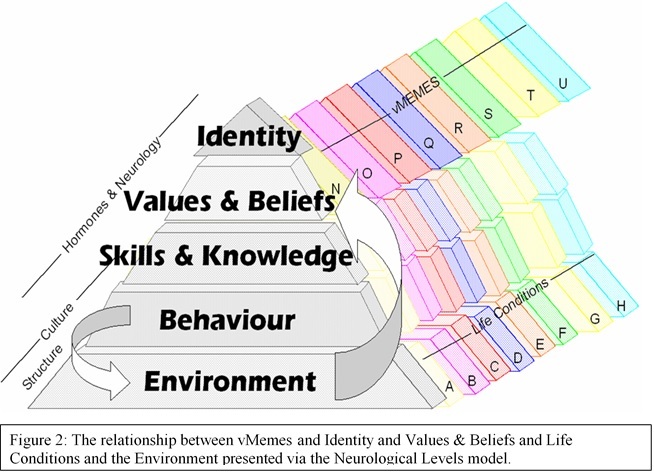 Figure 2 shows a graphic of the relationship between the SDi and Neurological Levels concepts. The basic presupposition of this schematic is that whichever vMEMES are dominating in the selfplex strongly influence the formation of ‘Identity’ and ‘Values & Beliefs’ relative to whatever life conditions are prevailing in the ‘Environment’. 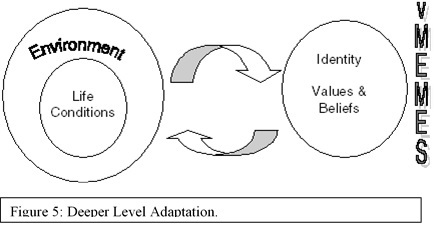 The linking of SDi to Neurological Levels allows the therapist to operate at either what I call the Nominal Level (Figure 4) or the Deeper Level (Figure 5). This approach makes use of the original (pre-SDi) Graves coding of A-H for life conditions and N-U for vMEMES as shown in basic terms in Figure 3. This enables consideration of whether the vMEMES dominating in the selfplex are appropriate to the life conditions being experienced in the Environment. Thus, a major change in the life conditions being experienced should, in a healthy individual, produce a matching vMEME response to enable the individual to cope in the changed life conditions. (This is why vMEMES are sometimes described as ‘coping mechanisms’.) In Graves’ terminology, an existential state is in place when vMEME is matched to life conditions. Working at the Nominal Level essentially involves what Dilts intended: namely that therapists work with clients to ensure that their neurological levels are aligned for healthy mental functioning. So, for example, a teenager needs the Identity of ‘student’ in the Environment of school; but, if he lives in the Environment of a rough and violent neighbourhood, he’d better change his Identity to ‘street tough’ if he wants to survive on the proverbial ‘mean streets’. This level of change is what Gregory Bateson (1972) called Level 1 Learning and Don Beck & Chris Cowan (1996) termed First Order Change. It does involve change but within the existing set of paradigms. The change, in fact, can be considerable; but the Identity/Environment matches such as student/school and street tough/rough neighbourhood are well-established. The Deeper Level may well involve paradigm change because now we look at what is actually going on in the Environment – ie:. the life conditions, and how the vMEMES are shaping Identity and Values & Beliefs to cope with the life condition changes in the Environment. In my book, Knowing Me, Knowing You (2006), I used the following example of a man who had mastered change at the Nominal Level: “At work, he’s a Manager; with his partner, he’s a Lover.” Nominal Level Adaptation appears to be successful. 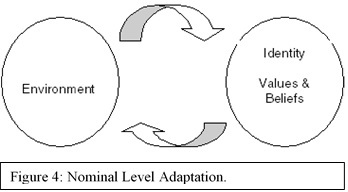 However, successful Nominal Level Adaptation depends on what is happening at the Deeper Level which can be much more complex. If the man’s partner is loving and caring (B/PURPLE life conditions in the Environment of their relationship), which vMEME would match? O/PURPLE would be the best fit and would strongly support the Identity of Lover, with values of love, caring, belonging, etc. However, if the partner is concerned with getting her own way and dominating him (C/RED life conditions in the Environment), which vMEME will be the best match? Almost certainly P/RED. The man has to know if he is more powerful than his partner and what his position is in the ‘power pecking order’ of the relationship. He must know who is in control? Such shifts as those described in the book excerpt clearly involve paradigm shifts: Level 2 Learning in Bateson; 2nd Order Evolution in Beck & Cowan. In extreme circmstances, the shifts in thinking may be so violent, it would be more applicable to call them Level 3 Learning or 2nd Order Revolution! When addressing two-person relationships, such as a married couple in conflict, I find it can be illuminating, if not completely revelatory, for the client to undertake Robert Dilts’ (1990) Meta-Mirror exercise whereby the client gets to see him/herself as their conflicted partner sees them and also how their conflict appears to others. For the dynamics of group inter-relationships, I have used toy soldiers and dolls to represent the players in the scenario, including a figure for the client. The client then looks down on the players as though they are on a stage and decides in godlike fashion strategies for who should do what. All through this process, I will facilitate the client by asking what vMEMES and memes are in play and what attitudes and behaviour are then predictable. I have found this method allows a client to go meta to (beyond or abstracted from) their own immediate and highly subjective thoughts and feelings with regard to the situation. From the above and the case studies to study, I trust it is clear to readers that, not only do I believe SDi is an approach which can be used in therapy, but I have used it with great success and regard it as fundamental to my work as a counsellor and therapist. However, there are certain limitations as to the use of SDi as a therapeutic map. Firstly SDi outlines motivational systems and how they work. Whilst there is hardly anything more important in understanding someone than identifying what motivates their attitudes and behaviours, attitudes and behaviours are also influenced by temperament. Someone who is naturally shy, for example, is not going to become naturally gregarious through any application of SDi as such. A different understanding and different techniques are called for. Back in 2005 I had a client whose tendency to anxiety I tried to remedy by focussing on building up her PURPLE and RED vMEMES. What really made the difference was when I used negative reinforcement, taken directly from B F Skinner’s (1938) concept of Operant Conditioning. The model that I eventually used to identify the root of this client’s problems was Hans J Eysenck’s construct of temperamental dimensions: Psychoticism-Extroversion-Neuroticism (Eysenck, 1967; Hans J Eysenck & Sybil B G Eysenck, 1976). Graves (1971/2002) speculated that there was a link between temperament and motivation but had no significant evidence for it. N N Trauel (1961; reported in Eysenck, 1967) found a link between Extraversion and obedience/conformity. William Moulton Marston’s (1928) model of Dominance, Influence, Steadiness & Compliance clearly associates temperamental descriptors with motivational descriptors in 3 of his 4 behavioural types, with a weaker association in the fourth. These associations are depicted in Figure 6 (Keith E Rice, 2006). Yet generally there seems to be little research on links between these 2 elements of personality. Even so, SDi can be of benefit to the therapist using Behavioural techniques. As Skinner’s Operant Conditioning uses reward or punishment as consequences for behaviour, so SDi enables us to identify what is rewarding and punishing for each vMEME. For example, the ‘naturally shy’ person referred to above is likely to become more outgoing in an environment where they feel accepted for who they are (PURPLE) and they are made to feel good about the contributions they make, their self-esteem being boosted (RED). Similarly a loud-mouthed extravert is likely to quieten down if heavily criticised for their behaviour, a reduction of esteem which is likely to inhibit RED. A second limitation of SDi in therapy is that it tells us nothing about the Unconscious. While ‘scientific psychology’ has yet to find a way to investigate the Unconscious experimentally and all kinds of unfounded assertions are made about it, there is little doubt there is some element of the mind (selfplex?) which houses repressed thoughts and memories. One study which illustrates this only too dramatically is that of Linda Meyer Williams (1994) who found 65% of a group of 117 adult women had no memory of being sexually abused when young children. (As the children had been admitted to hospital, there were medical, social work and police records which showed unequivocally that the abuse had taken place.) As Sigmund Freud (1923b) thought the Id and, to a lesser extent, the Superego were located in the Unconscious and these factors in the Freudian mind can be mapped to vMEMES, it will be interesting to see what crossovers will develop between Psychoanalysis and SDi in years to come. The individual case studies in the Services section of my website are typical of the work I do in that they deal with maladaptive schemas formed during childhood and then reinforced via experience. 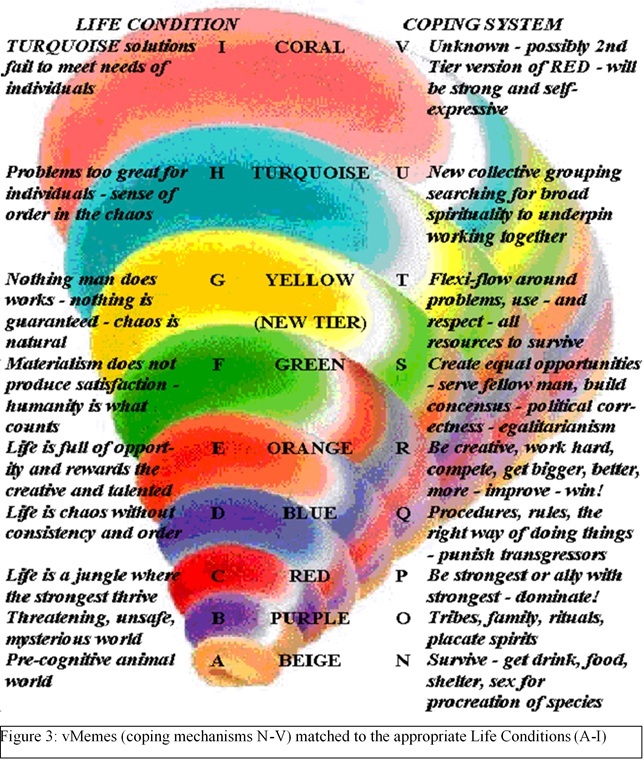 The work is focussed on giving back the maladaptive schema to the person who gave it to the client, thus freeing PURPLE and RED to develop more healthily. Names and peripheral details have been changed in the case studies, for confidentiality purposes. Otherwise, the stories in the case studies are pretty much what happened.